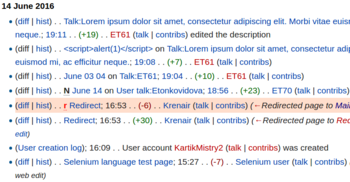 This page is a translated version of the page ORES review tool and the translation is 36% complete. The default threshold is deliberately set low to capture almost all vandalism cases (so a number of false positives are also likely to occur). This is in contrast to anti-vandalism bots which set the threshold high to capture only the most obvious vandalism cases (and thus have few false positives). اگر شما نمی خواهید بسیاری از ویرایشهای را تیک بزنید، شما به سادگی می توانید حساسیت ابزار (پایین را ببینید) را تغییر دهید. If the ORES extension is activated, you can enable the review tool within your user account by looking under the "beta features" section of Special:Preferences.The review tool will augment Special:RecentChanges and Special:Watchlist by highlighting and flagging edits (with a red-colored ب) that need review, because the ORES prediction model judges them to be "damaging". You will also be able to filter these lists by selecting the "Hide probably good edits" option. 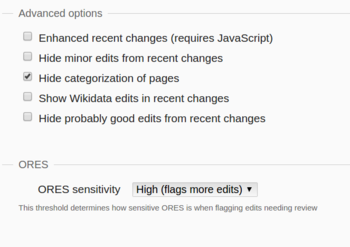 When you select this option, the review tool will hide any edits that ORES judges to be unlikely to be damaging.